I don't know if there's anything that makes you feel as old as sitting in a hospital waiting room while your dad is in Intensive Care. I live 400 miles away from my parents, and I was quite startled to hear that my mother had called an ambulance for my father. My parents aren't that old. I didn't jump in my car as soon as I heard Dad was in trouble. I waited until he had gone through his emergency surgery to remove a blood clot from his leg. It wasn't until after his surgery that I learned he had been Med-Flighted from the small hospital in Fayetteville to a larger one in Huntsville. He needed a vascular surgeon, and Fayetteville didn't have one. I am a young professional, living a free life. I have no responsibilities other than myself. I love my career and I love my friends. I go to dinner parties every week. I travel as much as possible. I buy more books than I possibly have time to read. I sell Mary Kay. My parents aren't supposed to get sick. I canceled my classes when I heard my dad was going to need another surgery. It was Friday, so I'd have two days to travel without missing too much work. But of course it didn't work that way. I missed the visitation hours by the time I got into town Friday night. ICU patients only have four visitation windows throughout the day, and you can only stay 20 minutes. I drove to the hospital anyway, because my mom, my aunt, and my sister were still there. They were sitting in the break room, and they looked tired. Worn out. We sat and talked for a few hours more, and I slept at a friend's house that night. My aunt convinced my mom to stay at her house while she took on the duty of staying in the ICU waiting room until morning. 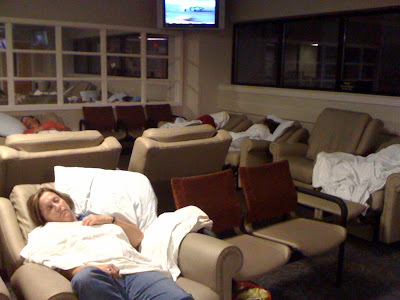 Spend the night in a chair in a hospital waiting room? I didn't know people did that. My turn came soon enough. By day five of my father's stay in ICU, my aunt said she couldn't stay another night because she needed to get some sleep for work the next day. My mother looked like hell, so I couldn't leave her there and stay in my friend's comfy bed again. I told Mom I'd stay at the hospital, so she went home for the first time since the ambulance picked up my dad. The hospital clerk assigned a recliner and a locker to me. I was given a pillow and two blankets. There were large plasma TVs hanging in every corner of the large waiting room. A nice lady was assigned to a recliner across from me. We took our shoes off, washed our faces, wrapped our blankets around us, and talked for hours. Her name was Nancy and her mom was in ICU. Her dad had died about a year ago, and her mother's stomach was eaten up with ulcers, presumably from the blood thinners she had been taking for so many years. Nancy looked tired and very calm. She had stayed at the hospital for several nights already. People who are that worn tell the truth. She was worried that she didn't have any vacation or sick days saved up. She had used them all up when her father got sick and died. "I can't leave her," she said sincerely. Regardless of the consequences, she was staying in that damned waiting room as many nights and days as it took. There were a lot of good books and magazines in the waiting room. People had taken care to donate quality reading materials. The TVs stayed on, but the volume was turned down. The overhead lights stayed on, annoyingly. I saw three episodes of The Brady Bunch in a row. One had been enough! I found a recipe I wanted in a magazine, so I tried to quietly tear it out. Tick-tock, tick-tock. It was only 2 am. The first visitation wasn't until 10:30 in the morning. It was going to be a LONG night. My mom and my cousin Melvin showed up soon. I must've finally dozed off. I had pulled my hoodie over the top part of my face to shield out the lights. I was tired when my aunt came and sat beside me. Icky tired. I looked like crap, but so did everyone in the waiting room. People don't wear make-up when they sleep at the hospital. I walked over to the gift store and bought some hot coffee for me and Nancy. She tried to pay me back for it but I refused. We had all grown accustomed to lining up in front of the ICU double-doors during visitation hours. We herded ourselves like cattle, entering two at a time. Sometimes we pushed our luck and the nurses let three of us stay in Dad's room during the allotted 20 minutes. The man next to Dad had died that morning. The family were 7th Day Adventists, and they came in to sing after his passing. My father, who is NOT a 7th Day Adventist, was sure he was in a psychiatric ward. The morphine he was taking did not help the situation. He tried to free himself a couple of times. He was not able to stand or walk on his own, but he began pulling out his IV and removing the oxygen mask from his face. The nurses had to tie him down for a while. As I left my dad's room, I saw Nancy in her mom's room. She was wearing a hospital smock and she was walking over to her mom. I don't know what she was doing because I thought it would be impolite to watch. My family and I sat and talked for a while. I saw Nancy come out of ICU and she asked me if I was staying the night again. Dad was scheduled to move to a regular room that day, so I said probably not. She said to me, "It was nice talking with you," and she looked at me for a long time. I looked back at her and smiled. Dad got better and moved to the vascular floor. I stayed at my family's farm that night, then came back around noon to check on him and Mom. Mom looked tired. Dad looked like a real person again. He was watching CNN and picking at his lunch tray. I stopped by the ICU waiting room and looked for Nancy, but she wasn't in there. I still don't know what happened to her mom. I bought this painting from an artist friend today. Isn't it gorgeous?